"It’s absolutely irresponsible to know that your product is killing people and not have a warning label on it." Former California Governor Arnold Schwarzenegger is coming after oil companies, claiming they were “knowingly killing people all over the world” by playing a part in triggering and exacerbating global warming. Schwarzenegger made the announcement on March 11 during a live recording of POLITICO’s Off Message podcast, revealing he was currently in talks with several private law firms to aid with the lawsuit. 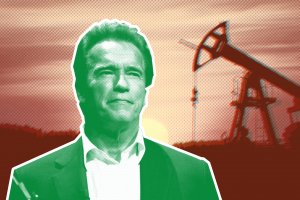 “The oil companies knew from 1959 on, they did their own study that there would be global warming happening because of fossil fuels, and on top of it that it would be risky for people’s lives, that it would kill,” Schwarzenegger said on the podcast. He compares the oil companies role in global warming to the tobacco industry hiding the fact that smoking can severely harm people’s health. And because people should be made aware of how much their lifestyle contributes to harming the environment, he believes any product that was produced, or processed, using fossil fuels (hint: that’s nearly everything we buy) should have a label on it. After all, we’ve done the same with cigarettes, following the signing of the the Family Smoking Prevention and Tobacco Control Act in 2009. The former governor went as far as to say that ignoring the impacts of extracting and profiting from fossil fuels was comparable to first degree murder: “If you walk into a room and you know you’re going to kill someone, it’s first degree murder; I think it’s the same thing with the oil companies,” he said. Mayor de Blasio and Comptroller Scott M. Stringer are also planning to divest the city’s pension funds from fossil fuel reserve owners. In 5 years’ time, nearly $5 billion dollars could be divested from the city’s $189 billion pension funds. In December, Reuters predicted a series of lawsuits against oil companies. Legal action over climate change damages is underpinned by a growing body of research linking individual oil corporations with specific degrees of global warming. A study from the Union of Concerned Scientists (UCS), published in the journal Climatic Change, found that the carbon emissions linked to the 50 biggest private oil companies, including BP, Chevron and Shell, were responsible for 16 percent of the global temperature rise between 1800 ans 2010.